Another member of the ‘Pea family’ Chorizema are mainly found in the south west corner of WA like so many wonderful native plants. C. cordatum is one of the more widely grown species, named cultivars such as ‘Bush Flame’ however a number of others are well worth looking for. 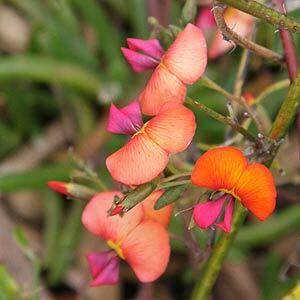 A very attractive low growing plant, Chorizema is a native shrub from Western Australia. A number of species not only grow well in the garden however they are also suited to growing in containers. Drought tolerant container plants are much sought after. From Western Australia they are a plant that requires excellent drainage, and they do like a sunny position to part shade. Well suited to growing in a rock garden, or along the edge of a retaining wall in a sunny position. Just about anywhere where they can trail into the sun. The flowers are very colorful and attractive and they are a plant with a reasonably fast growth rate. This is genus with a naturally straggly growth habit, however they can be pruned back. The only time to prune is immediately after flowering. This should be done each year, taking away as much as 1/3rd of the growth. Chorizema cordatum is referred to as the “Flame Pea’ or ‘Desert Pea’ due to its pea like flowers. Chorizema humile is a prostrate species. A well drained soil is required and a sunny position. Chorizema ilicifolium (picture right) is a relatively small shrub often less than 50cm.The orange and red flowers appear in late winter to early spring.